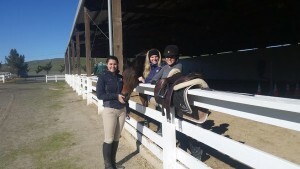 THE MOST COMPREHENSIVE EQUESTRIAN SCHOOL IN THE EAST BAY. Buy 2 lessons, get 1 FREE. Our full service staff will help you feel comfortable from your first lesson to the show ring. English riding lessons are offered Tuesday through Sunday throughout the day and evening hours for flexible scheduling by multiple professional instructors on over 10 lesson horses and ponies. The riding school serves all ages and abilities, designed specifically for riders intent on riding at least once or twice a week. Please refer to our photo gallery to reference the different levels of riders in our program. Note–with 24 hours notice, we can arrange on-site babysitting for your child while you enjoy your lesson! For pricing, forms, and further information, visit our Pricing, Forms, and Contracts page. Please call 925-960-9696 for a schedule of class times or for a tour of the facility. Our stables are closed on Mondays.